Democrats and progressive candidates saw a lot of encouraging success in this year’s municipal and school board elections in Iowa, but one major race remains outstanding: Tuesday’s Cedar Rapids mayoral run-off. Who leads the second-largest city in the state is a big deal – it should also be a reliably Democratic office, but it hasn’t been in past years. So, Tuesday’s race between November 7’s top vote-getters – Democrat Monica Vernon and Republican Brad Hart – will have a huge impact on city policies, as well as Eastern Iowa politics for years to come. Vernon led the crowded eight-person mayoral race in the November election with 30% of the vote, compared to Hart’s 20% (he narrowly beat out Scott Olson to advance to the run-off). It was a return to a local focus for the former city councilwoman who twice ran for the 1st Congressional District and was Democrats’ lieutenant governor candidate on the 2014 ballot. If she wins on Tuesday, the council will once again be led by someone who’s made inclusion and economic opportunity for all a key part of her time in public service. It’s even more crucial if statewide Iowa politics continue on the path they’re on and Republicans keep pushing a far-right agenda onto local municipalities. Because, as Vernon noted to Starting Line recently, it’s cities and the people who live in them who have to deal with the consequences of Republican legislation. Let’s take a quick look at some of the issues at stake in Tuesday’s election and why Democrats need to make sure to turn out for the run-off. Cedar Rapids is starting to see serious issues with a lack of affordable housing in the city, making it difficult for working-class residents and those affected by the floods to find a safe place to raise their family. When people lost their homes in the 2008 flood, many of their homes were only valued from $45,000 to $60,000. The average cost of affordable housing units in the city, however, was around $120,000. There weren’t a lot of entry-level homes that people could afford. Vernon has been working with city leaders to explore cheaper, safe options like the tiny homes concept. The issue of affordable housing has been one of the big dividing lines in the race. Hart wants to reactivate a housing commission that Vernon fears could make it much easier for the council to nix new housing developments. A big problem for progressive priorities at the municipal level in Iowa was the Republican-run legislature’s rollback of things like local minimum wage increases. Backfilling lost revenue from commercial and industrial taxes has also forced cities to shift the tax burden to property taxes, hurting middle-class families and small businesses. 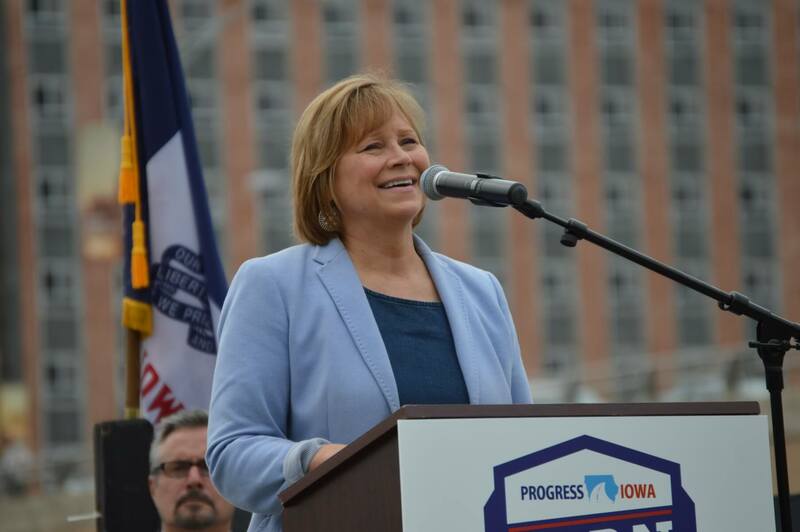 Vernon has said she’s looking forward to taking the city’s needs directly to the Statehouse, and plans on working with mayors from other Iowa cities – large and small – to build a coalition to push back on anything that weakens Iowa’s home rule laws. With the collapse of Iowa’s Medicaid system and mental healthcare support, cities are now on the front lines of providing care for some of the state’s most at-risk, whether it be in terms of care in facilities or with the police – where people with mental health needs often end up with now. Cedar Rapids has seen increasing problems in recent years in how it deals with minority communities. Racial profiling has become a big focus with local activists and the police department, and a lot of people from diverse backgrounds are moving into the city. The mayoral candidates were asked at several forums about the Black Lives Matter movement. While Hart gave some quick platitudes on the topic, Vernon dived in and admitted the city has real problems with race relations. While most Iowa municipal races are technically nonpartisan, most everyone knows which candidate is a Republican and which is a Democrat. And the longterm impact on local and state politics (as well as the policies that affect real people) can be significant. Cedar Rapids, despite being a heavily-Democratic city, has been run by a Republican mayor for the past eight years. Aside from the policy implications, that’s a big deal for regional and state politics. Outgoing Republican Mayor Ron Corbett is running for governor, challenging Kim Reynolds in the GOP primary. Very few expect him to succeed in that candidacy, but imagine if he did (or if he had a much better chance in an open field). A Republican with deep roots in one of Eastern Iowa’s top Democratic strongholds? That would be a very tough candidate to beat. Indeed, there’s a lot of Democratic insiders who would much rather face off with Reynolds than Corbett, all things being equal. That’s part of the reason why Democrats need to win these kind of high-profile offices. The mayor of Cedar Rapids today could easily be the congressperson of the 1st District or a statewide elected official tomorrow. The Democratic bench isn’t very deep in this state after multiple red wave cycles, but we should at least have a pipeline of promising stars coming up in our Democratic cities. Vernon is likely to stick to municipal government at this point, but it’s still crucial for the party infrastructure to hold onto these seats. The run-off election for the mayor’s office is this Tuesday. Information about voting locations can be found here.